Say I love you with a big helping of antioxidants! My fondness for this crunchy Napa Cabbage and Broccoli Winter Slaw with a Creamy Dijon Dressing just keeps getting stronger. Radishes and brussels sprouts add extra color and flavor, and everything is quickly chopped up in the food processor (or you can use a sharp knife). It even goes well with champagne, though of course I think pretty much everything goes well with champagne. 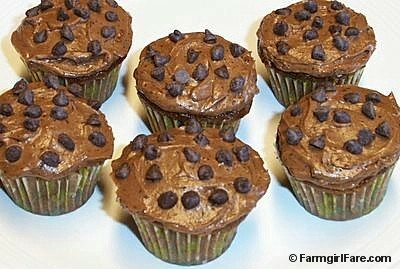 Or how about some Easy Chocolate Babycakes with Mocha (or Chocolate) Buttercream Frosting, which definitely go well with champagne (and milk). These cute little treats are made using my simple Emergency Chocolate Loaf Cake batter (which I've been making for about 15 years) and they're always a big hit. Enjoy! © FarmgirlFare.com, always cute, always hungry, always full of love. Heck with cooking we want more lamb pictures!!! You are one busy lady! Thanks for the recipes. Just finished reading the Emergency Chocolate Loaf Cake post, what a hoot! My hubby thanks you for the recipe as he has a chocolate emergency almost daily! LOL! !